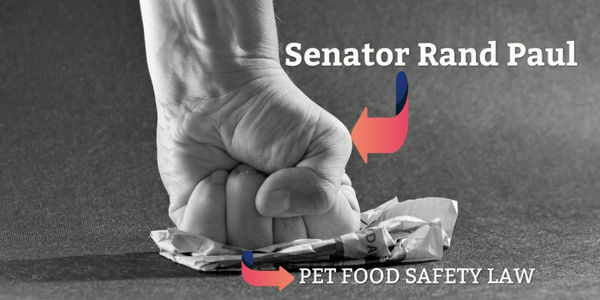 petition: Tell Senator Rand Paul to Give Us our Pet Food Safety Laws Back Now! Tell Senator Rand Paul to Give Us our Pet Food Safety Laws Back Now! Senator Rand Paul recently took deliberate action in Congress to delete pet food safety laws written to protect our pets. In 2007 after the deadliest pet food recall in history, Congress wrote a series of laws entitled "Ensuring the Safety of Pet Food." These laws promised pet owners updated pet food ingredient definitions, each requiring a quality standard. Congress also promised pet owners updated pet food labeling giving pet owners detailed "nutritional and ingredient information." In a devastating blow to pet food safety, Senator Rand Paul submitted an addendum to an unrelated bill in Congress completely deleting the laws promised us in 2007. H.R. 5554 Section 306 - submitted solely by Senator Rand Paul - completely destroyed the possibility of pet food safety. Senator Paul told constituents the pet food safety laws were deleted due to a conflict of interest with AAFCO stating the laws "called into question FDA's longstanding relationship with the Association of American Feed Control Officials (AAFCO), a voluntary membership association that maintains a published list of animal food ingredient definitions." The laws were a conflict of interest, but ONLY a conflict of AAFCO's financial interests. AAFCO - a private corporation - writes, owns, and profits from the laws governing pet food, including the legal definitions of pet food ingredients. Do you know the legal definition of "chicken" stated on your pet's food label? It is NOT the same as the legal definition of 'chicken' in human food. Do you know the difference between human food chicken and pet food chicken? Do you know the legal definition of "chicken meal" or "pea protein" or "animal fat" or "animal digest" or any other ingredient stated on your pet food label? You probably don't. Because the private company Association of American Feed Control Officials (AAFCO) owns the pet food definitions and charges $120.00 a year for access. AAFCO owns the regulations governing pet food labels too. AAFCO - a private company that is heavily influenced by the pet food industry - determines what information pet owners are given on a pet food label. And pet owners are not provided those legal details either. In human food, consumers have public access to detailed information on every single food ingredient. In human food, consumers can provide input to food regulations through public notices published in the Federal Register. But not in pet food. In pet food, everything is decided on and owned by the private corporation AAFCO. Pet food is the only U.S. product where laws governing that product are written by a private corporation. And Senator Rand Paul took deliberate action making certain that AAFCO continues to control and profit from writing pet food law. Tell Senator Rand Paul to give us our pet food safety laws back. Tell Senator Paul to immediately submit a new bill to Congress reinstating Ensuring the Safety of Pet Food laws promised us with the requirement laws be fully enforced by FDA within six months from bill approval. Pet owners have waited long enough for pet food safety.